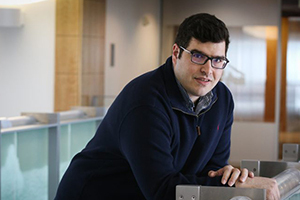 Konstantinos Oikonomou, a second-year PhD student at the department of Electrical and Computer Engineering (ECE) receives a prestigious scholarship from the Utah Governor’s Office of Energy Development (OED) and Utah Science Technology and Research (USTAR) through the Energy Research Triangle (ERT) Scholars competitive grant program. Konstantinos is pursuing his PhD degree at the ECE’s Utah Smart Energy Lab (U-Smart) under the supervision of Prof. Parvania. Konstantinos is interested in developing solutions for ensuring efficient and sustainable supply of electricity and water demand in urban areas that is becoming a challenge as urban population continues to grow with rapid pace. His research develops control methods to co-optimize the operation of urban power and water distribution systems in emerging smart cities, saving considerable amounts of precious energy and water resources. “ERT continues to support Governor Gary R. Herbert’s vision for accelerating Utah-based solutions to power our energy future,” said Laura Nelson Ph.D., the Governor’s energy advisor and executive director of the Governor’s Office of Energy Development. The ERT-Scholars grant encourages training of Utah’s next generation of energy researchers. “ERT-Scholars creates a pipeline of talent for Utah’s energy industry by awarding highly-motivated young scientists who are passionate about making real changes in the way Utah thinks about energy,” says Ivy Estabrooke PhD, executive director of USTAR.